It’s pouring rain today and will probably continue all weekend. Staying safe and dry at home could easily end in cabin fever by Sunday night, except for one little thing — I went to the annual Shimogamo book fair a few weeks ago. 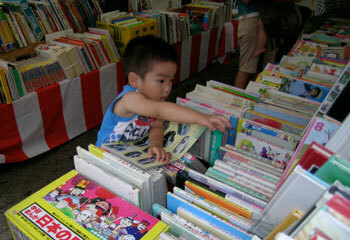 Unlike the monthly fleamarkets at Kitano and Toji, the Shimogamo book fair occurs but once a year. 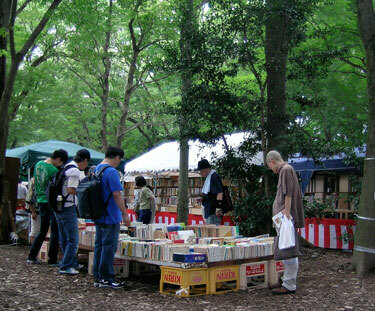 Used book dealers from all over Japan, set up booths in the garden of Shimogamo Shrine for a book-lovers’ festival that goes on for four days. And to a book maven such as myself, it is a treasure trove of delight. 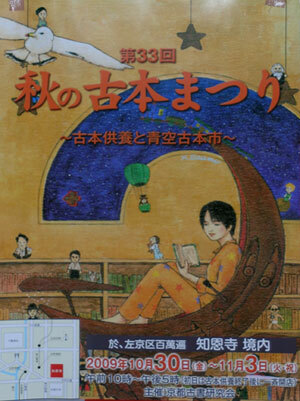 So on this rainy weekend, I can curl up with my treasures very much like the child in the festival flyer shown at right. 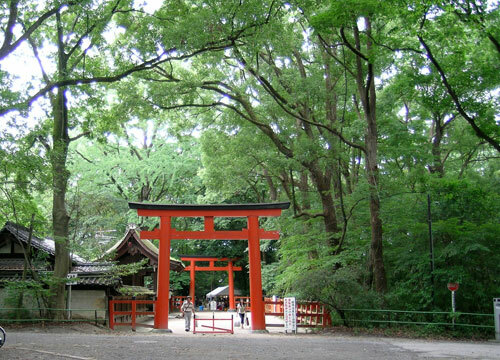 Shimogamo is a Shinto shrine located about 5 minutes from my house by bicycle. It dates back to the 17th century and is a world heritage site. Shimogamo Shrine was built within the Tadasu no Mori,”the forest of truth.” And despite the encroaching urbanism of modern Kyoto, a portion of this forest is preserved within the temple garden, some of the trees being marked as particularly sacred by a wrapping of straw rope. According to legend, all lies will be exposed in this forest. The particularly rainy summer we had this year made the garden a lush green contrasted sharply by the vermillion Torii gates that mark the transition from the profane world into the sacred space of the garden. And once inside, there beneath the canopy of trees in the forest of truth was all the books that book lover could ever love. Collections of magazines that span the last half century, books on every topic imaginable. Whether you are a music fan, a sports fan, a car enthusiast, history buff, or poetry lover, you will find a treasure waiting there to feed your soul. 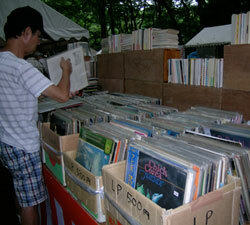 Of course, there are also a few other bits of soul food, like the vintage LPs for the jazz aficionado at left. Overall a nice lot of cool and hot jazz. Great opportunities to add some vintage jazz to your collection. 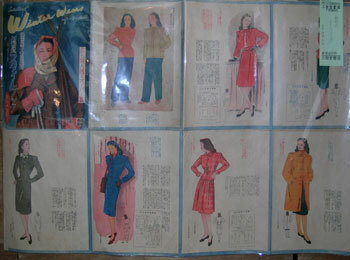 And among my personal favorites, there are sometimes a few vintage patterns from the 40s and 50s — in Japanese, of course. Last year I was able to buy a collection of kimono style books from the Taisho period (circa 1910). 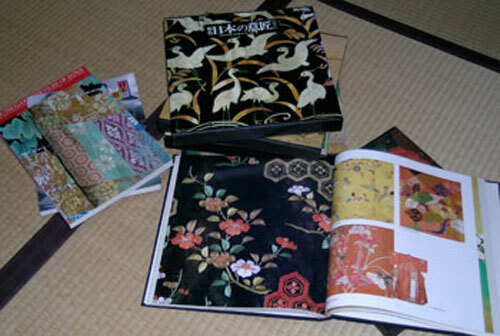 Kimono style books contain line drawings of various kimono styles available from a certain kimono dealer. 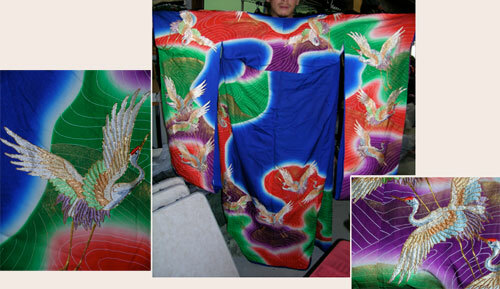 Since all kimono are made to order, the customer and dealer would discuss the drawing shown in the style book as a starting point for the order. The line drawings are uncolored since color would be one of the choices to be discussed, but the motifs to be dyed or woven into the kimono are clearly shown in the drawing. Old style books are a great resource for designers, so it was my hope to find yet another collection this year. Still you never know what you may find and wandering around, perusing the choices is part of the fun. Definitely, that’s a sentiment shared by my eager little friend at right. You’re never too young to begin a love affair with books. It was fun to see one so little enjoy himself that much. He and his mother eventually left with quite an armload containing books for each of them. And me? What did I buy? Well, I didn’t find that vendor with all the wonderful old style books again — maybe he decided not to come this year. But I was thrilled to find a catalog to a wonderful museum show I had seen 4 years ago. I had always kicked myself for not buying a catalog at the time, but now 4 years later I found it! And another fabulous book on kimono of the roaring 20s. But my pièce de résistance was a large six-volume set entitled Japanese Design in Art and that should keep me inspired — at least until next year’s fair! 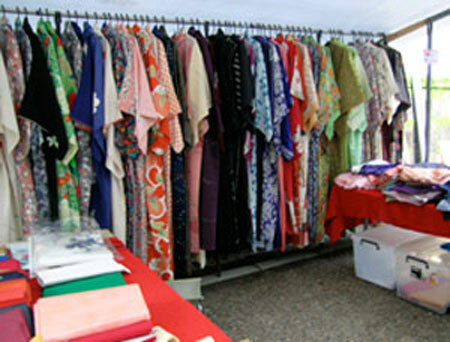 This entry was posted in flea markets, Kyoto living on September 12, 2009 by admin. 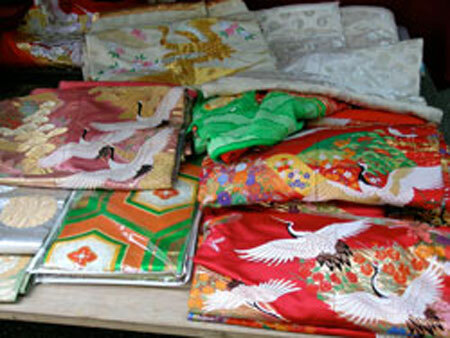 With more than 1600 Buddhist temples and 400 Shinto shrines in Kyoto, it’s no surprise that Kitano is not the only shrine to host a monthly flea market in its garden. Each of the markets has its own character. 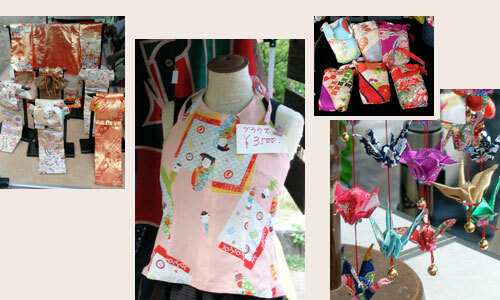 While Kitanois known as a treasure-hunter’s paradise, Chion-ji is known for contemporary crafts. 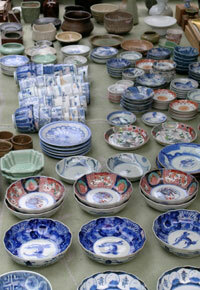 All of the vendors must have made their wares. 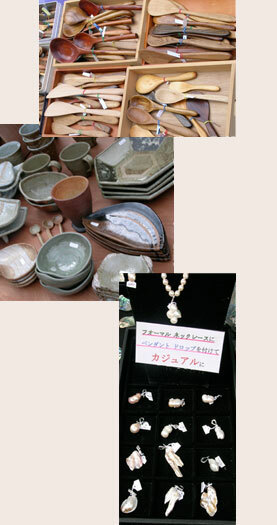 Woodwork, pottery, and cultured pearls comprise just a part of the range of visual treats available to Chion-ji shoppers. 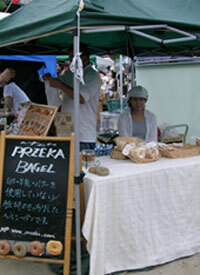 There is simply every craft imaginable along with lots of garden vegetables and homemade food, even homemade Japanese bagels. 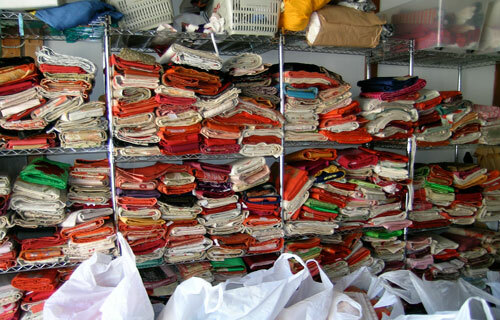 And of course, there are fiber artists of every persuasion: dyers, weavers, quilters and patch workers. Lots and lots of patchworkers. With so many kimono being turned into doll clothes, western clothes, cell phone cases and mobile fantasies, it’s no wonder that kimono prices are becoming so dear! 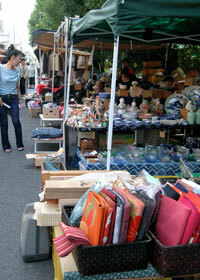 This entry was posted in flea markets, Kyoto living on September 24, 2007 by admin. 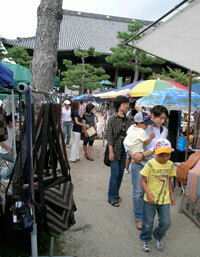 …because the 25th of each month is the flea market at Kitano Tenmangu. True, you need to travel a little further than the Christmas tree in the down stairs living room to find those wondrous surprise that await you. But the trip to Kitano shrine is just a 10-minute bicycle ride from my house, and that’s where the fun begins. In the gardens and streets surrounding the shrine, vendors of every exotic treasure imaginable display their wares in a myriad of little stalls packed one right after the other. 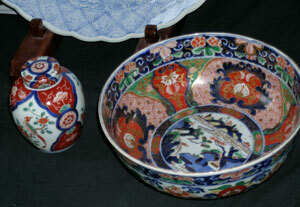 So, stroll past the porcelain, stop to swoon over the Imari, sneak past the sweet shops with their elaborate little treats (you can click on the picture, if you want a bigger peek), spend a few moments browsing the antiques. Then keep going till you come to kimono. 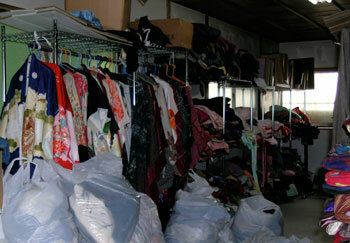 Kimono on racks, kimono in stacks and kimono in piles on the floor. oo-oo-oh! it’s just like Christmas morning! 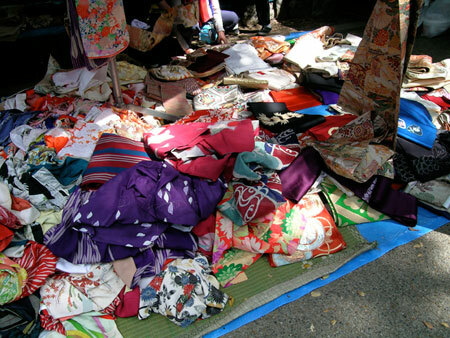 This entry was posted in flea markets, kimono, Kyoto living on September 9, 2007 by admin.